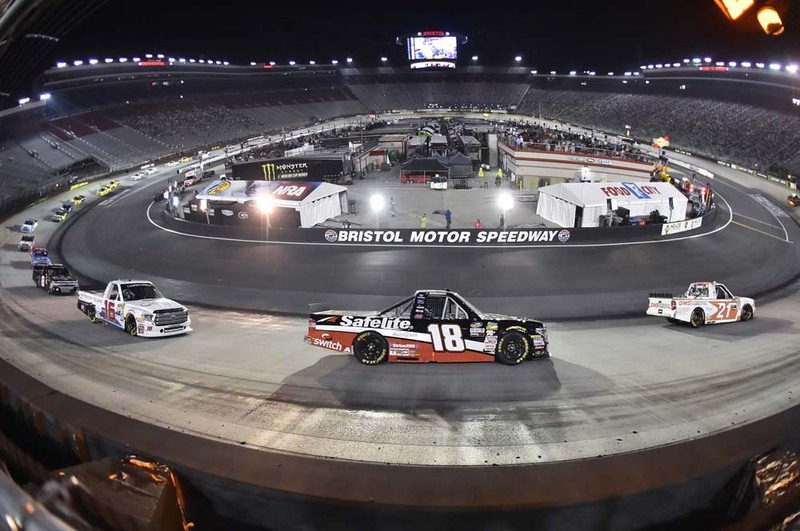 With his ninth-place finish in the UNOH 200 at Bristol (Tenn.) Motor Speedway, Noah Gragson finished second in the NASCAR Camping World Truck Series and earned 10 playoff points. 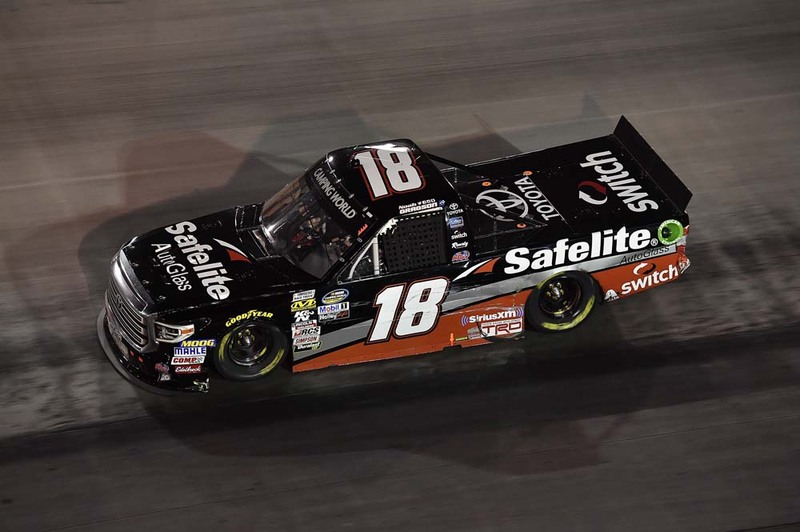 Gragson started from the seventh position and put his Safelite AutoGlass Tundra out front for seven laps en route to his 10th consecutive top-10 finish this season. When the Truck Series Playoffs begin next Sunday at Canadian Tire Motorsport Park in Bowmanville, Ontario, the Las Vegas native will be the third seed behind Johnny Sauter and Brett Moffitt. In addition to the 10 playoff points Gragson earned for finishing second in the regular season standings, he earned 12 additional playoff points throughout the season with seven stage wins and his victory at Kansas Speedway in Kansas City. 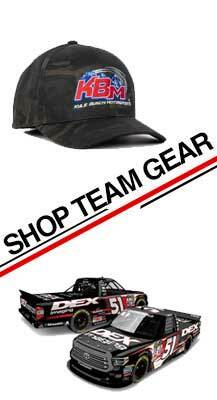 He begins the Truck Series Playoffs 13 points about the cutoff line for advancing from the Round of 8 to the Round of 6. Gragson started the race from the seventh position and had advanced one spot when the first caution of the race occurred on lap 14. When a one-truck spin slowed the field for the second time on lap 27 he had returned to the seventh spot. Battling what he described as an extremely loose Safelite Tundra, the Las Vegas native crossed the stripe to complete Stage One in the ninth position. 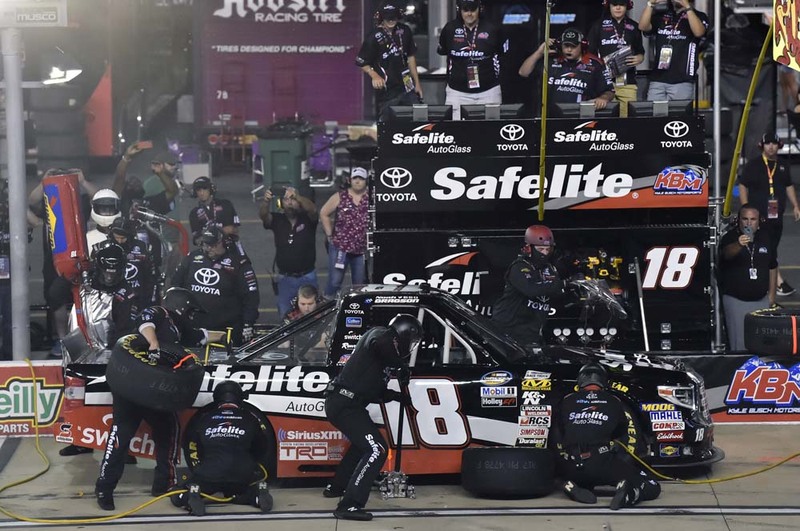 When pit road opened, Fugle summoned the Safelite Tundra to pit road for four fresh tires, a full tank of fuel and a major trackbar adjustment. Stage Two went green on lap 26 with Gragson scored in the 11th position, but he lost a handful positions when he had to slow to avoid a spin in front of him early in the stage. After falling back to the 16th spot early in the Stage, the 20-year-old driver communicated that that handling of his truck had improved late in the stage and he was able to work his way back up to 14th before the end of Stage Two. With the handling of the Safelite Tundra improved, Fugle called for a two-tire and fuel stop in an effort to gain track position for the Final Stage. Gragson took the restart from the second position, on the outside of row one, and was able to get a good launch down the backstretch and was able to clear Johnny Sauter for the race lead through Turns 3 and 4. The Safelite Tundra would remain out front for seven laps before Sauter retook the lead. Gragson slowly fell back in the running order as the entirety of the Final Stage was run under green-flag conditions. He would cross the stripe in the ninth position earning his 10th consecutive and 12th overall top-10 finish across 15 starts in 2018. What tracks do you think you’ll excel at in the playoffs? Johnny Sauter collected his fifth NASCAR Camping World Truck Series victory of 2018 and the 22nd of his career. Stewart Friesen finished 0.236 seconds behind Sauter in the runner-up spot. John Hunter Nemechek finished third while Parker Kligerman and Gragson’s KBM teammate Todd Gilliland rounded out the top-five finishers. The race featured five cautions for a total of 38 laps. There were six lead changes among four drivers. Gragson led once for seven laps. He led at least one lap in all but two of his 15 of his regular season starts and continues to lead the Truck Series with 475 laps led on the season. Despite missing one race due to illness, Gragson finished second in the Truck Series championship standings, 84 tallies behind championship leader Johnny Sauter. Gragson enters the Truck Series Playoffs with 22 points and will be the third seed. Gragson will be back behind the wheel of the No. 18 Safelite AutoGlass Tundra when the Truck Series resumes action Aug. 26 at Canadian Tire Motorsport Park. Live coverage of the race begins Sunday at 2:30 p.m. on FS1.